Bob Marshall embodied the spirit of wilderness, and fought for wilderness protection throughout the United States. His passion for wilderness was nurtured in the Adirondack Mountains. They include numerous accounts of his pioneering hikes in the High Peaks and of his explorations in the vast wild region south of Cranberry Lake, spirited defenses of the forever wild Forest Preserve, and a charming sketch of guide Herb Clark. The articles reveal Marshall’s deep personal connection to the Adirondacks, and the inspiration for his commitment to wilderness preservation. 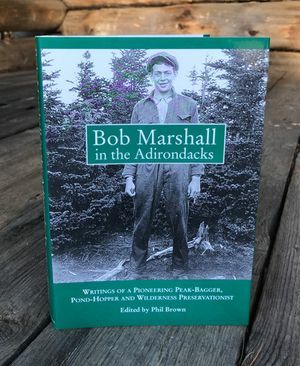 Also included are three articles by Bob’s brother George Marshall; pieces by historian Phil G. Terrie, conservationist Paul Schaefer and writer Phil Brown; a humorous ode to peak-bagging by writer Bill McKibben; and, the Adirondack Council’s proposed Bob Marshall Great Wilderness.